The combined net worth of the world’s billionaires has reached a new high in 2015 of $7.05 trillion, according to the latest compilation published by Forbes magazine on Monday. 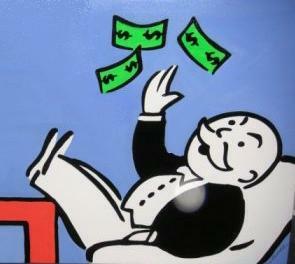 There are a record 1,826 billionaires, each with an average wealth of $3.8 billion. Relative to last year, the world’s billionaires have increased their combined wealth by more than 10 percent, from $6.4 trillion in 2014, while the total number of billionaires has grown by 11 percent. In introducing its report, Forbes noted the striking disconnect between the continued surge in the wealth of the world’s ultra-rich and the state of the world economy. “Despite plunging oil prices and a weakened euro, the ranks of the world’s wealthiest defied global economic turmoil and expanded once again,” the magazine commented. This growth in the wealth of billionaires is bound up with the continued rise in global equity markets. The FTSE All-World Index surged to record highs last month, and US markets have continued to break records. Stock ownership is overwhelmingly concentrated in the hands of the wealthy, who have been the prime beneficiaries of “quantitative easing,” record low interest rates and other government policies. The United States, the home of Wall Street and center of global financial capital, again has far and away the highest number of billionaires—536. Since the beginning of the so-called “economic recovery,” in 2009, some 95 percent of all income gains in the United States have gone to the top 1 percent. Meanwhile, nearly one in four children in the country lives in poverty. At the top of the list of billionaires in the US are familiar names, including Bill Gates, the founder of Microsoft, whose individual wealth alone surged by $3.2 billion, to $79.2 billion. Among Americans, Gates was followed by investor Warren Buffet, the list’s biggest gainer for the year, who now has a net worth of $72.7 billion, up $14.5 billion from last year. Further down the list, one finds individuals like hedge fund manager Steven Cohen, a personification of the essentially criminal character of American capitalism. A year ago, Cohen’s former hedge fund, SAC Capital Advisors, pleaded guilty to insider trading charges. Cohen himself was never charged, and he simply transferred his fortune to a new firm, Point72 Asset Management. Cohen made $1.3 billion last year, bringing his total net worth to $11.4 billion. If categorized as a separate country, California, with 131 billionaires, would be second on the Forbes list, following only the US as a whole and China. Among the new billionaires in California are Travis Kalanick and Garett Camp, co-founders of Uber, a car-sharing service that specializes in coordinating drivers who are paid low wages, with uncertain and irregular hours. Such labor is increasingly being seen as a model for the American economy as a whole. Carlos Slim, the Mexican telecommunications magnate, was second on the global list, with $77.1 billion. Half of Mexico’s population of 122 million people lives in poverty, defined as an income of less than about $6 a day (2,329 pesos a month). Slim’s personal fortune is roughly comparable to the combined annual income of these 60 million impoverished Mexican workers. While Slim is the richest single individual in Latin America, the country with the largest number of billionaires in the region is Brazil, with 54. Half of Brazil’s 60 million children live in poverty. Overall, the country with the second largest number of billionaires is China, with 213, followed by Germany, India and Russia. China, which remains a cheap labor platform for world capitalism, is home to 71 of the 290 billionaires on the Forbes list this year, or about a quarter of the total. The richest individual in China is Wang Jianlin ($24.2 billion), a real estate magnate, followed by Jack Ma ($22.7 billion), the founder of Alibaba Group, an Internet trading company. A surge in equity markets in China last year has benefited not only Chinese billionaires. Forbes commented, “If you invested in the companies run by billionaires on the top 20 China billionaire list, you’re tracking their wealth right into your brokerage account.” The initial public offering of Alibaba last year became an international spectacle of speculation and greed, netting global investors tens of billions in profits. On India, Forbes commented that the country’s 90 billionaires “are riding high on Prime Minister Narendra Modi’s promise of ‘good times.’” The right-wing Hindu fundamentalist politician, elected last year, has quickly pushed through a raft of pro-business measures, while promoting the country as the world’s sweat shop. The richest Indian is Mukesh Ambani (net worth of $21 billion), the chairman and managing director of Reliance Industries Limited. About 60 percent of the population in India, or 750 million people, live on less than $2 a day. Russia has seen a significant decline in the number of billionaires, from 111 to 88, dropping from third to fifth on the overall list of countries. This is one result of the economic crisis that has engulfed the country, due to the sharp drop in oil prices and crippling economic sanctions imposed by the United States and Europe. One of the primary aims of these sanctions is to encourage a section of the Russian oligarchs, fearful of the impact on their wealth, to turn against the government of Vladimir Putin. Certain broader comparisons are revealing. The debt that Greece owes the banks of Europe, for example, is about $90 billion. The wealth of the world’s billionaires is more than 77 times this amount. In the United States, the city of Detroit has a debt of $6.9 billion, or one one-thousandth of the collective wealth of the world’s billionaires. Both Greece and Detroit have been dragged through a disastrous restructuring dictated by the banks and endorsed by the entire political establishment, resulting in mass impoverishment and the decimation of living standards. The Forbes list gives expression to the parasitic character of world capitalism as a whole. Whatever the particular sector of the economy with which their wealth is associated—finance, manufacturing, telecommunications—the fortunes of the ultra-rich are invariably tied to surging stock markets. 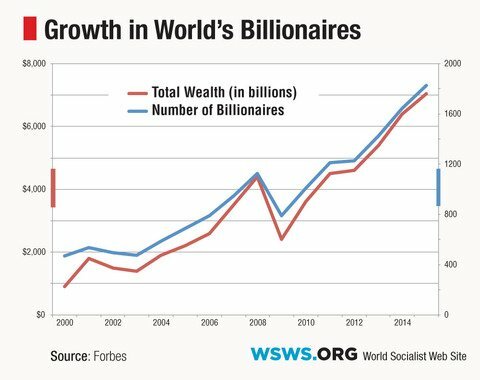 Since 2009, when the policies of bank bailouts, near-zero interest rates and “quantitative easing” were fully implemented, the wealth of the world’s billionaires has nearly tripled. Led by the Obama administration in the US, the ruling class has funneled trillions of dollars into the financial markets while carrying out a relentless assault on the working class. The universal character of these processes makes clear that what is at issue is the very nature of the existing economic order. The extraordinary growth of social inequality and the immense transfer of wealth from the bottom to the top are expressions of a bankrupt and diseased social system, capitalism. The decay and crisis of this system are producing the means for its own demise—the eruption of social conflict and class struggle on a world scale.